This started out as one of my dishes named hodge podge. If I like what I came up with, it gets a name. 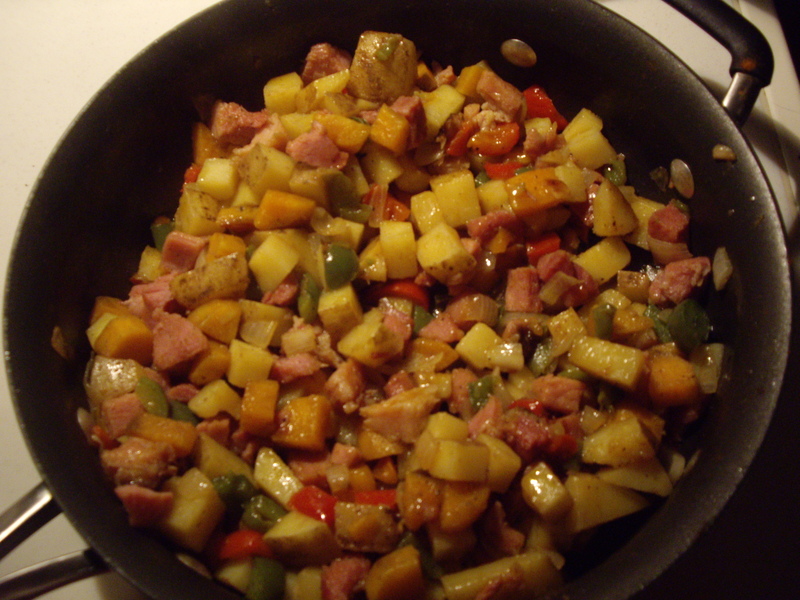 So, this is now known as Ham Hash. I am sure you have probably heard of Skillet Hash or Corned Beef Hash. Basically fried potatoes and roast beef. I thought that I’d try ham and see what happened. You will need a large skillet with a lid. Add the oil to the skillet and heat up over medium/high heat. Add everything to the skillet, but the ham and seasonings. Season with the salt, pepper, and paprika. Stir til everything is mixed well. Cover with lid and check once in a while to prevent burning or sticking. After 5 or 10 minutes, lower the heat and continue to cook until the potatoes are tender. Dump in the ham and mix in. Cover and let the ham heat up with the rest of the food. Let that go for a few minutes. This will serve 4-6 depending on if you eat it alone or with something else.